There have been millions of words written about how to use Facebook to promote a business, cause or collection of funny cat pictures. What I’ve found is that you should really just focus on four words. Study all the words you like, but they won’t do you any good if you haven’t mastered these four. Not only is that the most important lesson for benefiting from social media, it seems to be the hardest for people to master. There are a couple things about Facebook ads that Zuckerberg would prefer I didn’t tell you. But, you should be informed. First off, you may remember the Page Like Story and Sponsored Story ads I’ve discussed. They’re the ones that tell your friends that you’ve “Liked” something in hopes of getting people to follow your excellent lead. They do work well, but Facebook had a bit of legal trouble with them. 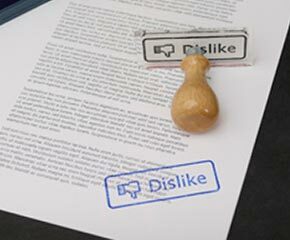 It turns out there was no way to opt out of having your “Likes” shown to others. A handful of users sued Facebook about this and the case was settled for $20 million — half for lawyers, half for charity. Also, you’ll now be able to opt out having your “Likes” publicized. If the case had gone forward, Facebook could have been looking at a class action with 100 million members. I think they’re pretty happy with the outcome. The other thing you should be aware of is that Facebook ads are really bad at sending traffic to your website. My experience with this echoes what I’ve heard from others. If you set up an ad on Facebook that is a link to your own website rather than your Facebook Page, it’s not going to do you much good. When people are on Facebook, they don’t seem to want to leave. If they do click your ad and land on your website, they won’t stay long. I’ve seen bounce rates over 90% and average time on site less than 10 seconds from these ads. It’s a big waste of money. It’s a different story when your ad leads people to your Facebook Page. Assuming there’s something beyond self promotional content on it, you could convert 30% or more into fans. Once you have a fan, you can reach them over and over again. That’s how you get them onto your website — get them to “Like” you first, then invite them over for milk and cookies. Just be sure to keep the blatant self promotion to a minimum. Mix that with some curated content — good stuff you find on other websites — and you’ll have a better Page than most. There are a lot of variables to figure out when posting to your Facebook Page. What kind of content should you post? How often should you post it? What time of day should you post? Read this article for a guided tour through these factors. Posting boring content isn’t going to do you much good. So, read this article for some great pointers for making content that will make an impact. In part one of this two-part post, I mentioned that I don’t really like Facebook. Between then and now, I’ve come to like it even less. You see, I spent all that time explaining how certain aspects of Facebook advertising works, and they changed the entire interface before I could write the Exciting Conclusion! So it goes with the digital age. Let’s have a quick look at the new interface and I’ll show you how to find the Page Like Story option that I raved about previously. Then I’ll show you another kind of “sponsored story” and how to use the two types of ads together. We’ll wrap up with the reason you should have a Facebook advertising account even if you aren’t running ads. I don’t really care for Facebook. I bet you don’t exactly love it either. Maybe you even hate it. The problem is that you have to use it these days or you’ll be left in the dust. Seriously. Facebook gets as much traffic as Google. Despite this, people don’t really like it. One survey found that user satisfaction with Facebook was on par with the IRS or airlines. That’s pretty bad. Here’s the good news: You can succeed on Facebook, no matter how much you dislike it. I’m referring to success in a business sense, of course. I’m sure you can find some help elsewhere if you’re worried about succeeding socially. First off, let’s be clear about your objective on Facebook. Bring in more money? No. That comes later. To succeed on Facebook, your goal has to be to build an engaged community with a common interest. People aren’t on Facebook to be sold things. There isn’t usually commercial intent with a Facebook user. There’s social intent. Engage with your audience socially and they’ll be more likely to remember you when they do have commercial intent. So, you know your objective. How do you get there? If you want to skip to the advanced stuff, scroll down the the Sponsored Stories header below. First, you need a Facebook Page for yourself or your organization. That part’s easy. Next, you need to put content out there. Remember, you’re not selling. You’re connecting. Share useful articles, fun pictures, interesting videos, or news items that will interest your target audience. How much to post and how often varies. You’ll have to experiment, and don’t be afraid to ask your fans if they’d like to hear from you more or less. Now you’ve built it. They’ll come, right? Wrong. Your Facebook page is not a Field of Dreams. It needs to be promoted just like any other web property. Put a link on your website — visitors to your site are hopefully in your target audience. Share the page with your personal Facebook friends — they may not be your target audience, but you need some “likes” to get started. Buy some “likes” if need be — don’t count on these being useful connections, but they can help get a new page off the ground. Numbers 6 and 7 will mean giving Facebook some money, but they are also the most effective ways of promoting your page. Sponsored stories are particularly potent, though widely misunderstood. Since regular ads are fairly self explanatory, let’s jump right into Sponsored Stories. There are a few kinds of Sponsored stories. I’m going to focus on just one of them, Page Like Stories. My friends might see an ad like this. A Page Like Story shows an ad for your Facebook Page with a Like button. The difference is it only shows this to people who are friends of anyone who has ever liked your page. And, it shows them that their friend has liked the page. They are ads that come with social endorsement. Everyone has developed some ad-blindness these days. Our eyes are hard to catch. Show us a picture of a friend and we’ll look. That’s what makes these sponsored stories so powerful. It gets even better, though. Not only are you targeting people who are one degree of separation from being a fan already, but you can further narrow down your targeting by interest. How about an example? You run a business in lovely Chapel Hill, North Carolina. You sell lots and lots of UNC gear — jerseys, bumper stickers, sky blue face paint, that sort of thing. You can run a Page Like Story to expose your Page to the friends of your current fans. Lots of them are probably in and around Chapel Hill, so that’s great. But, as anyone familiar with this area knows, there are other schools that people like… and they tend to feel quite strongly about this. A Duke fan will never like your page, even if they happen to have a friend who does. So, you target your Page Like Story to people interested in UNC, Tarheels, The Daily Tarheel, and anything else that makes sense. Now your Page Like Story will only appear to friends of fans who actually like UNC. Once upon a time, Facebook would expose your page to people every time one of their friends liked something you posted. No longer. They are trying to monetize now, as they stare down the barrel of an IPO. Around November 1, 2011, Facebook Pages started getting more paid impressions than organic impressions. It was the other way around for a long time prior. Now they show more ads and make it harder for you to get organic impressions. It will probably get worse, too. Advertising on Facebook is pretty affordable, though. It’s also pretty easy to get up and running with it. Just remember to Always Run Tests and make Data Driven Decisions. Check out part two of this guide to learn how to use different kinds of Facebook ads together and why you should have a Facebook ads account even if you aren’t running ads. Get a monthly supply of news, tips, and ideas to help you grow your business and leverage the power of the internet. I promise not to share your contact information with any third parties. Are you losing the reviews race? Serving small businesses and nonprofits in Raleigh, Durham, Chapel Hill and surrounding areas of North Carolina.